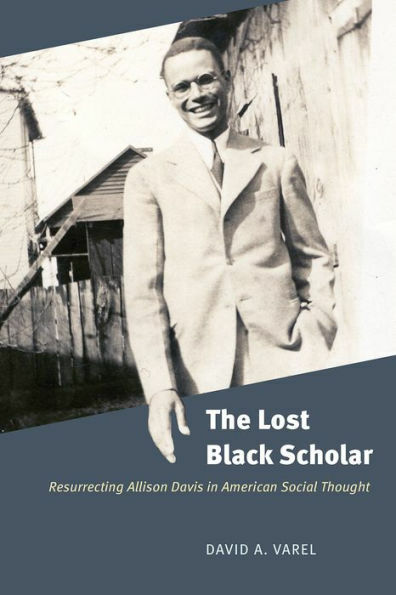 In The Lost Black Scholar, historian David A. Varel tells the story of Allison Davis, the first Black professor to become a full faculty member at a predominantly white American university—the University of Chicago—and a brilliant scholar who, despite making significant contributions to race-related issues in multiple fields, was underappreciated in his time and continues to be overlooked by scholars and historians today. William Boyd Allison Davis was born in 1902 and grew up in Washington, D.C. His father, John Davis, held a managerial position in the Government Printing Office, and named his eldest son after Iowa senator William Boyd Allison, who was instrumental in his securing an appointment in that office. After the 1912 election of Woodrow Wilson, a Southern-born Democrat whose policies and appointees re-segregated parts of the federal government, the Davis family fell upon very hard times: like so many others, John was demoted and eventually lost nearly two-thirds of his salary. Allison Davis attended Washington, D.C.’s Dunbar High School and made a name for himself in the field of literature at Williams College in Massachusetts. However, in order to effectively counter the junk science that was supporting white supremacy by claiming other races were inferior, Davis moved into the field of anthropology, studying at Harvard and the London School of Economics. As Varel noted at a book talk held at the Seminary Co-op bookstore in Hyde Park last month, this allowed him to “embody the politics of respectability in order to communicate in this sphere.” Davis believed that “the social world determines the differences among groups”—not genetics. By studying different groups using the the methods of social anthropology, he “…expose[d] the social forces that circumscribed the lives of racial minorities and the poor,” Varel writes in the book. A book, Deep South, came out of this study, of which Davis was the lead author. In it, the group of scholars argued “that caste and class were the primary elements of Natchez’s social organizations, but that caste was ‘the fundamental division,’” Varel writes. Davis and his colleague, Lloyd Warner, drew from scholarship on the East Indian caste system to argue that a similar system helped to explain the more limited social mobility of Black people in the South. But caste wasn’t the whole story—Davis and his team showed how caste strictures could be loosened “through a complex system of tradeoffs.” From this perspective, current race relations were not immutable; rather, they showed that “significant change was possible—if blacks could be empowered.” Deep South was well-received by academics and became “basic reading in sociology” in colleges and universities across the country. However, after World War II, the political climate in the country changed, shifting which intellectual theories were in vogue. “As Americans faced an external military threat, and as they witnessed the fall of democratic governments at the hands of fascistic regimes, many intellectuals closed ranks and sought to locate and nurture a distinctive “American Way of Life” that could defeat the forces of aggression abroad,” Varel writes. Davis’s work, which focused on the ways in which divisions in race and class undermined that idealistic way of life, “did not fare well in such an environment.” This was a trend in Davis’s career: there were multiple points when his ideas were in sync with the zeitgeist of one period but not in sync with others. In his work at the UofC—which was based in its now-defunct Department of Education—Davis was critical of the ways that segregated schools were failing their students. “In his research on school acculturation, he showed that segregation prevents lower-class and minority children from learning the dominant middle-class culture, and thus served to maintain rather than offset social divisions,” Varel writes. The book’s appeal was evident by the rapt audience at the book talk last month, at which Varel, a visiting assistant professor of history at the University of Mississippi, was interviewed by Chicago journalist and author Ben Austen. Jared Davis, one of Allison Davis’s grandsons, offered a few remarks as well. Varel explained that this book came out of his search for a dissertation topic: he wanted to investigate someone who worked to counter pseudo-scientific racism. Specifically, he wanted to learn more about work in this area done by Black scholars who did not receive credit for it at the time. As Varel noted, “Allison Davis provided a way to tell this story.” From a personal perspective, Jared Davis said that the book helped him to better understand and appreciate his grandfather’s work. Katie Gruber is a contributor to the Weekly. She is from Cincinnati but has lived in Hyde Park since 1996. Her book “I’m Sorry for What I’ve Done”: The Language of Courtroom Apologies was published by Oxford University Press in 2014. She last wrote for the Weekly in June about criticisms of a new state scholarship program.